There was a recent question in the VMTN developers forum around automating the acknowledgment and resetting of a triggered vCenter alarm using vSphere SDK for Perl. This is actually a trivial task using the vSphere Client, you would first identify the alarm and acknowledge the alarm by right clicking on the alarm and selecting "Acknowledge Alarm". To reset the alarm, you would right click on the alarm and select "Reset Alarm to Green". To automate this task using the vSphere SDK for Perl which uses the vSphere API, you would perform the same two API operations. Doing a search, you will find a method called AcknowledgeAarm which should does exactly that, but if you try to search for method to reset an alarm, you will notice no such method exists. This was something I was aware of since vSphere 3.5 API, but never understood why it was kept hidden. You might ask, how is the vSphere Client performing this operation and what API method is it using? Sadly, this operation is one of the many hidden API methods that VMware choose to hide and not public expose for various reasons. However, there are several ways of identifying some of these hidden vSphere API methods and properties. 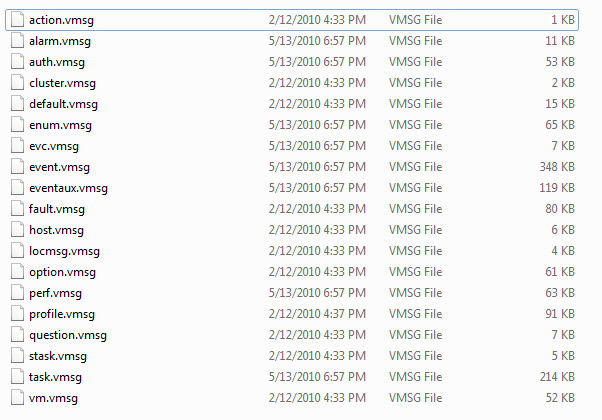 When you install the vSphere Client on your workstation, there is a catalog directory (e.g. C:\Program Files\VMware\Infrastructure\Virtual Infrastructure Client\4.1\Catalogs\Default) that is created based on the version of vSphere and within the vim directory, there are these *.vmsg files that contain information regarding the VIM API (Virtual Infrastructure Management API) and searching within these files, you will find some hidden goodies. 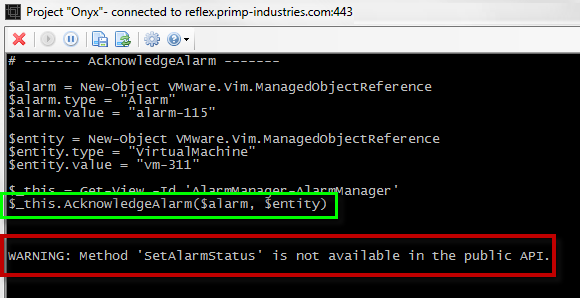 alarm.AlarmManager.setAlarmStatus.label = "Set alarm status"
alarm.AlarmManager.setAlarmStatus.summary = "Sets the status of an alarm for an entity"
As you can see, there are other methods with respect to the alarmManager that is documented, but the method above is not documented in the vSphere API reference. We can take this information and further validate by using the vSphere MOB to see what parameters are required for this method. We can perform one additional confirmation to ensure that the method above is actually the method the vSphere Client is performing when resetting an alarm. The tool that we will use here is Onyx, yep, it is not only useful for PowerCLI but for all vSphere developers and administrators. I created a dummy alarm that would trigger if a VM is powered on or powered off and by running Onyx to capture the API calls when acknowledging and resetting an alarm. 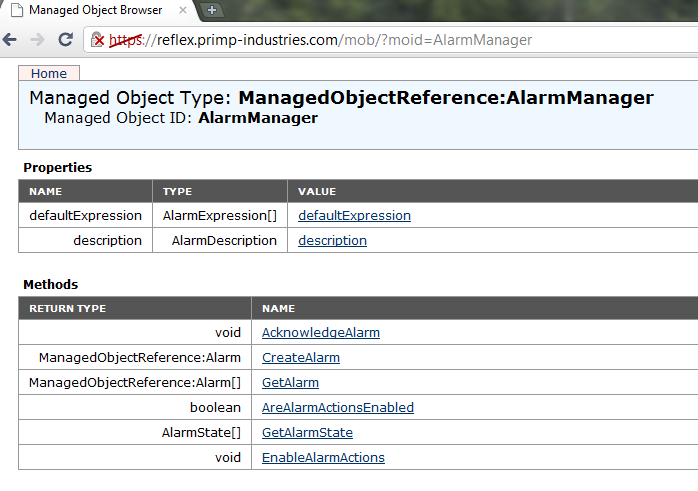 As you can see, the two operations uses the AcknowledgeAlarm and the hidden SetAlarmStatus API method. We now can definitively say that the above hidden API method is being used and now we need to figure out how we can incorporate this method into the existing vSphere SDK for Perl. Now we are ready to implement this method in a vSphere SDK for Perl Script. I quickly threw together a script that helps manages your vCenter alarms using the CLI by listing all active and triggered alarms in either a red or yellow state. Cool! Thank you William. I’ve looked at file task.vmsg as you wrote and I’ve found this lines: UpgradeManager.#####. But I don’t know how to use it. Could you looked at this UpgradeManager ? Could you answer me how could I use this manager, please ? is there any way we can trigger a compliance change notification in VCM when some admin changes a default VMware vCenter alarm that was enabled on the environment. I’m using VCSA and accessing via vsphere web client.I am running PRTG to monitor alarms in vCentre and have an alarm in vcentre that runs a bash script that disables and enables sensors in PRTG based on if the hypervisor is going into or out of standby mode. My problem is that if the Alarm is NOT reset to green the script isn’t run again until that centre alarm is “reset to green” and PRTG starts to alert (and fills up email!). How do I accomplish the above when using a web client and VCSA? I need to be able to acknowledge the alarm/ Reset to green either within my script (which is a simply bash script using curl to post to the PRTG API). You solution doesn’t work unless I have a client installed which isn’t available for 6.5. Also I am using VCSA and not the Windows version so POWERCLI not an option not to mention installing anything onto VCSA if not advisable. Any help greatly appreciated.